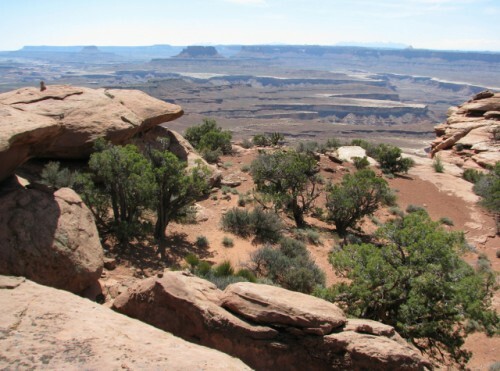 Even today, the landscape in Canyonlands National Park seems pretty remote, but human habitation within the boundaries of Canyonlands began about 10,000 years ago, roughly 8,000 B.C.E. The first human visitors were nomadic hunters and gatherers who didn’t stay long and didn’t build homes or other structures from stone, but they did leave rock art behind – fascinating works that archaeologists and historians still study. About 2,000 years ago, like in Zion, people began to settle down and cultivate maize and domesticate dogs and turkeys. There were two cultures at Canyonlands, the Puebloan (previously called the Anasazi) and the Fremont cultures. They used tools and made permanent structures from stone, and continued the rock art tradition. In about 1,300 A.D., these people left the area; probably due to the changing weather patterns that made it more difficult to grow crops. The Utes and Pauites arrived as early as 800 A.D. and the Navajo came around 1,300 A.D. They have been in the area since that time, but the archaeological record shows that their use of the Canyonlands area was pretty minimal. Spanish explorers coming up from Mexico were challenged by the geography here beginning in the 1500s. The first explorations did not produce the route from New Mexico to California that they were looking for, so they didn’t establish any permanent settlements here. Next came the fur trappers from the north and west in the 1700 and 1800s, searching the rivers for beaver, otter and other fur bearing animals. They explored the Colorado and Green rivers, and left their mark by way of some carvings on the canyon walls, but don’t appear to have spent any significant time here. Mormon settlers set up a mission in Moab in 1855, but didn’t stay long due to conflicts with the Native Americans already living in the area. Major John Wesley Powell came to Canyonlands in 1869 on an official expedition of the Colorado and Green Rivers. This was the same three month expedition where he mapped the Grand Canyon. Of course, it was still another 10 years before there was much going on in the way of Western settlements, when Mormons created settlements nearby in Blanding, Moab and Monticello. 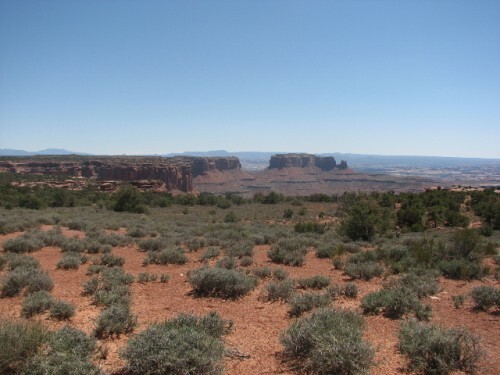 In the 1880s Canyonlands activity picked up a bit, when ranchers began grazing cattle on the mesas. Cowboys found the best grazing lands and access to water sources, and continued to use what are now park lands until 1975. Outlaws found hideouts here too – Butch Cassidy hid in Canyonlands, and so did Tom and Bill McCarty (who are credited with introducing Butch Cassidy to banditry) and Tom’s brother in law, Matt Warner. Fun facts: The McCarty’s robbed a bank in Roslyn, WA (my neck of the woods) and all four of these outlaws were raised Mormon. 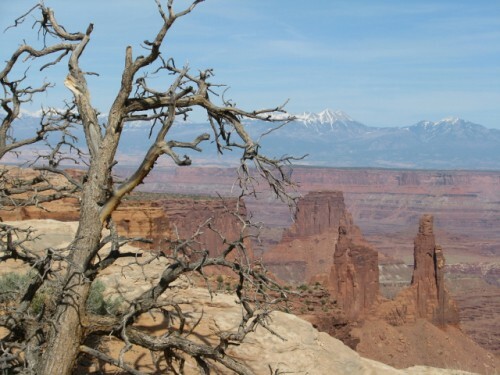 Tourists were finally able to access what is now Canyonlands beginning in the 1950s, largely due to the nuclear arms race. Yep, the country’s quest for uranium lead to the government enticing uranium miners to the area, and the government and the miners built over 1,000 miles of roads in Southeast Utah. Little uranium was found within what became the park boundaries, but the region produced a significant amount. Evidence remains in the park of uranium mining and the camps created by the miners, and most of the existing roads at Canyonlands are due to the mining activity here. Bates Wilson, the Superintendent of Arches National Park, advocated for the creation of Canyonlands beginning in the 1950s; he achieved his dream when President Lyndon B. Johnson signed legislation creating Canyonlands on September 12, 1964. The park now consists of three sections that are not connected within the park by roads – to access each you have to leave the park and drive around the boundaries of the park. They are Island in the Sky – near Moab and the most accessible and visited section, the Needles District – near Blanding, Utah and accounting for about 35% of the parks visits, and The Maze section – which even today is very remote and makes up just 3% of the parks visits. The Maze has no paved roads and no services – you either have to hike or pack in or use a 4×4 vehicle. And you have to pack everything in and back out, including all your water and your poo too. The NPS website recommends that you bring whatever tools necessary to repair your own vehicle, and they posted a warning explaining that towing fees can run more than $1,000! That’s a little beyond my desire for roughing it. The Park Service estimates that The Maze receives fewer than 2,000 visitors per year – it is considered to be one of the most remote areas in the United States! I’ll be talking about our visit to the Island in the Sky area in my next post!